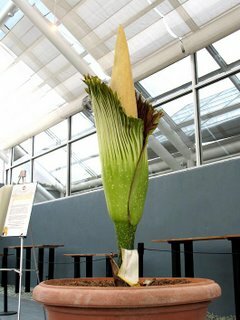 The Amorphophallus Titanum at the Brooklyn Botanical Garden is blooming! This has not happened since 1939. Pretty Lady sees that she will have to make room in her busy pre-departure schedule to pop by the garden and see it, although perhaps she will have to bring along a lavender-soaked hankie. 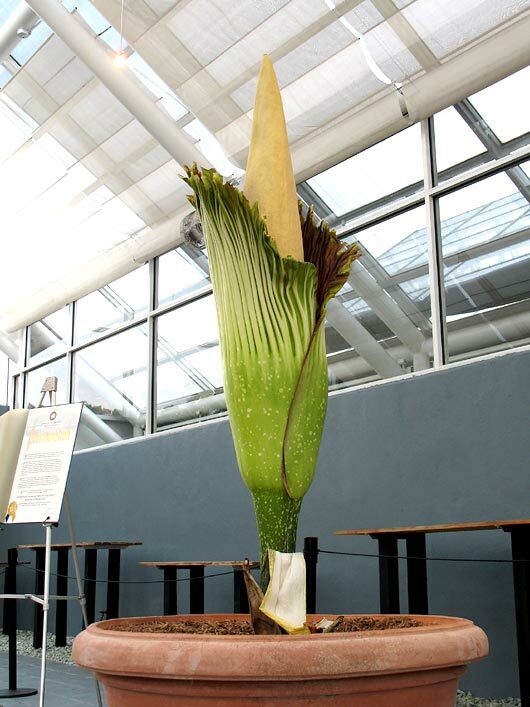 This flower's common nickname is the 'corpse flower,' due to its distinct odor of putrefaction. For those of you who are not fortunate enough to live near the Garden, they have kindly set up a blog, a photo diary and a webcam, so that horticulture enthusiasts worldwide can track its progress. The pollination pictures are especially interesting. Bet they don't have anything like this in London, or even Paris? Actually, it's from Indonesia. And I read on the blog that it has stopped stinking; it only stank for about twelve hours. Natives in Sumatra believed that these flowers were carniverous, and so they destroyed them to keep from being eaten. Although how they believed the plant would catch them first, I have no idea. Wait a minute. Do you mean to tell me that the last time this giant plant bloomed and stank like corpses was just prior to the second World War? What an ominous sign. Thimscool, it's not the same actual plant. This plant is only ten years old. Evidently there was one plant that bloomed in Manhattan in 1937, and one that bloomed in the Bronx in 1939, thus becoming, temporarily, the Bronx Official Flower. Telling, that. What a wonderful place to get married. My favorite place is the water lily pond, but the rose garden and Japanese garden are close runner-ups. I wonder if any weddings were scheduled during the 12 hour stench! I still say it's a harbinger of the apocalypse. Pack your bags! That's what the ladies call me, oh yeah.